style rookie: Doesn't this just scream "80's trash"??? Doesn't this just scream "80's trash"??? So today my mom and I biked into what is known as "The Art District" in our town. We stopped at this records store, Val's Halla, practically a landmark. 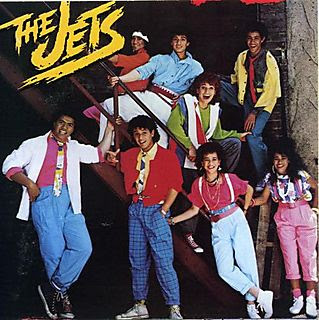 I was browsing through the records and came across The Jets. I've never heard their music before, but their outfits were so, well, rad (you heard me.). All the bright colors! It reminds me of Saved By The Bell. Check out the guy in the red in the middle, he looks like Screech. I think it's what drove me towards later buying a bright orange windbreaker at a thrift store. It's just so RAD.